I'm sure we have mentioned before that we love interviews. But we do! It's always an opportunity to learn a bit more about our favorite artists. 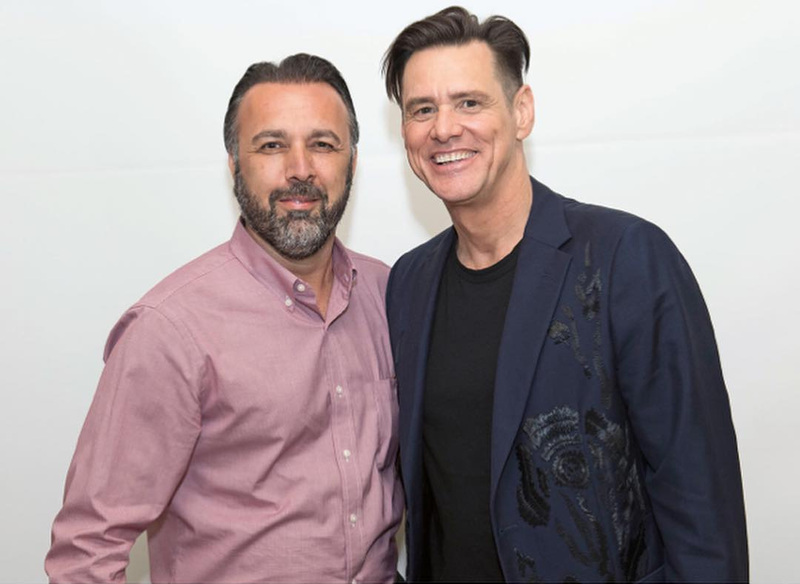 Turkish journalist Barbaros Tapan did a great interview with Jim Carrey for the Skylife Magazine website at the "Kidding" press conference. You are one of the greatest comedians of our generation. How did you get into comedy? My father... If you knew him for five minutes, you felt like you knew him for 50 years. He would walk into the room and everybody would become his friend. He gave me the bug to be funny. He supported me, and he was my champion. He was the one who suggested "Hey, there's these places called comedy clubs and if you want to go check it out, let's write a routine together." So, I was writing a routine with my dad. He was so corny it was horrifying. He and I went down to this ultra-tragically hip comedy club called Yuk Yuks. It was where I started. I was 15 years old, and my mother dressed me in a polyester suit because she saw and heard that was what was hip. I got on stage and started doing my thing. So, then the owner of the club, Mark Breslin, with whom I have had a relationship for years since then, got on a microphone backstage and started playing on the speaker and he went, "Totally boring, totally boring. Where are you from with the suit?" And he harangued me until I left the stage and I didn't go back for two years. Then I went back and slaughtered it. You are also a painter and sculptor. How did you become interested in visual arts? I have always drawn, and I have always painted little bits here and there. My childhood was mostly that. I even sent a letter to McGraw Hill to try to publish my children poems about life. When I started to sketch, I was exactly eight years old. What is it like for you to create something through visual arts as opposed to the movies? It's all the same thing to me; it's all painting and sculpting. What's the difference between playing a character with certain beliefs and thinking I will make this limb that way and do this that way? It's the same thing, you are sculpting a character. What would you call the style that you paint in? Spew. I don't know what the style is, and I am not into theory. I have had people come in, curators come to my house and say, "There are four different painters in here, and they are all cool, but can we focus on one area?" And I go, "No." You are back on sets with your new TV show Kidding. How do you feel about your comeback? Well, I hope I have a major one. You feel that you really don't want to be in this business and to center your life around fame or who is at the top of the stratosphere anymore. I know that sounds strange, but I struggled for a long time feeling like that. And then finally it just occurred to me one day, you have been out of the business for five years, you left. The only thing keeping you here is this physical avatar that does this for a living. It's a much bigger thing who we are. So that enabled me to come back and play in a serious way. This show is going to living rooms and TVs around the world. Can you take us into your living room and describe it to us? In my world, I like everything to be a little bit interesting to look at, so I will just give you one example, I have a coffee table that is made out of lily pads and things like that. I like to be entertained by my own space. I have a lot of paintings on the wall, and if you walk into my house, it's as if my brain exploded onto the walls. And there is other people's work as well that I get inspired by, including a John Lennon original, which is kind of great. So when I wake up in the morning, I look at the things that I enjoy around me. I go, "Okay, there's something to shoot for. It's good." 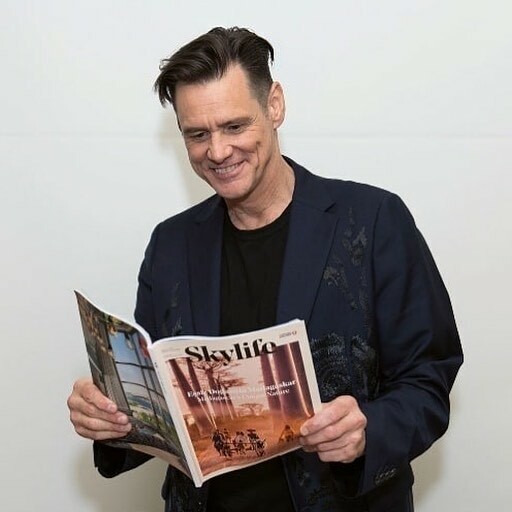 If you talked to the 20-year-old Jim Carrey, what advice would you give him about success, fame, money, and avoiding the pitfalls of the business? I would say to the 20-year-old Jim Carrey, "Hang on, it's going to be wild, going to be a bumpy night, but a wonderful ride." I would say, "It's not who you are. You will never be able to define yourself through this business, period, so enjoy yourself and do things that serve people and bake them up something cool that they are going to love. And that's it, you just are making meals and people are going to eat them or not eat them and that is it." How do you feel or think that fame has affected your life and your personality? You are 56 now. Do you feel different than before? I think I have handled it pretty well. I think it's odd as hell, anybody can wish for it, and you can want to be an astronaut, but until you get in that machine that spins you around and makes you want to vomit, you really don't know what it's like. You don't know what the moon is like until you get up there and go oh, one wrong move, I'm dead. So being famous is kind of like that, you get there, and you go oh, this is actually not a survivable environment, so how can I make it survivable? What was the weirdest encounter with a fan that you ever had? There was a fan in Spain that showed up and he was convulsing with tears and sobs to get near me. And he created dolls of me and him on a couch hanging out. I still have one, he gave it to me on the red carpet and I have it in my theater, because it's so bizarre, strange, weird. I don't want to say creepy because he was sincere in his love, but it was too far, like that crazy "My God Jim, hold me, I love you" kind of thing. -- Source: Skylife Magazine. Click to comment this article.